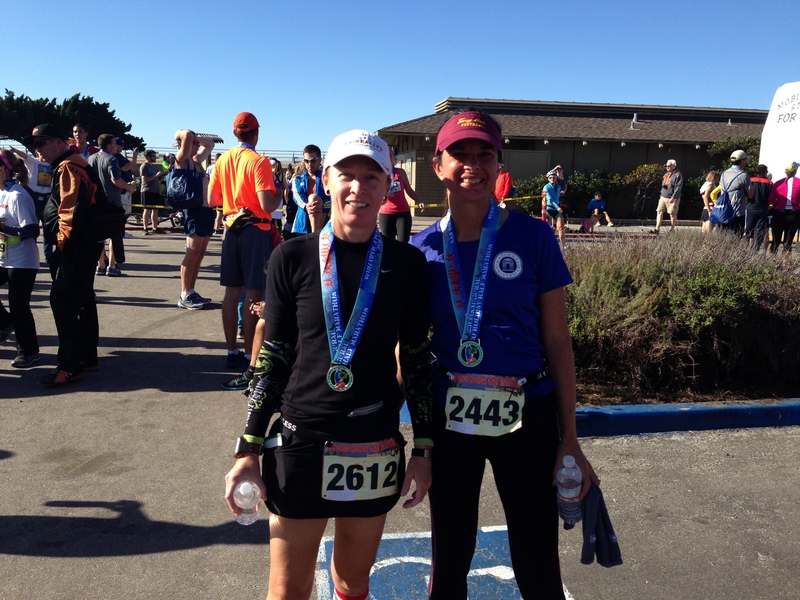 The Inaugural San Diego Half Marathon Race Report – Trees & Flowers & Birds! The night before I knew I wouldn’t sleep so I was thrilled when some old friends from the baseball years with 17 invited me out to dinner at Ruths Chris steak house. A lovely relaxing meal of superb steak and potatoes and then my favorite creme brulee with a modest amount of red wine sipped throughout the dinner was just the perfect way to keep my mind off the race. However, I did indeed not sleep hardly at all even though I was home by 10:30. I *might* have dozed off twice for about and hour or maybe two tops. The alarm went off at 4:30am and the scramble to get ready began. Representing the company. 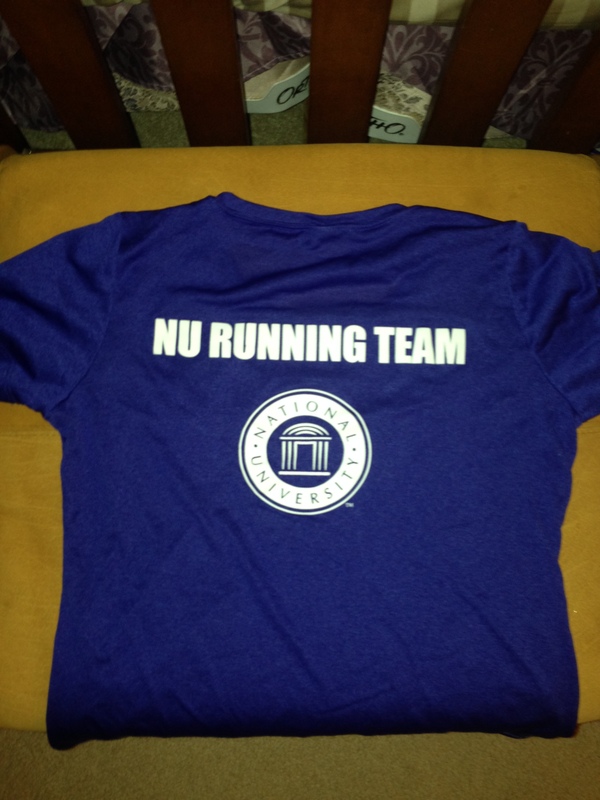 This race was not officially tied into the Holiday Bowl that NU sponsored, but it was close enough! Full pile of race gear ready to go. Something else to be happy about – even though we were arriving a solid 90 mins before the start of the race, it was in the parking lot of a small shopping center so the grocery store and the Jack in the Box were both open. We went into the Jack in the Box and immediately used their bathroom and then sat at table in the relative warmth of the restaurant as I ate my breakfast. We people watched and checked in on Facebook and then watched as the line for the bathrooms even in there got long so we jumped in one more time to use them rather than heading out to the port a potties behind the grocery store. As far as pre-race waiting around goes, it was actually not that bad! So much better than being left standing around in the 40-ish degree morning air. About 30 mins before the start we went outside to get acclimated and scope out the gear bag drop off and the starting corrals. I also tracked down my co-workers from NU who were also running, and we shivered in solidarity discussing our targeted finish times. 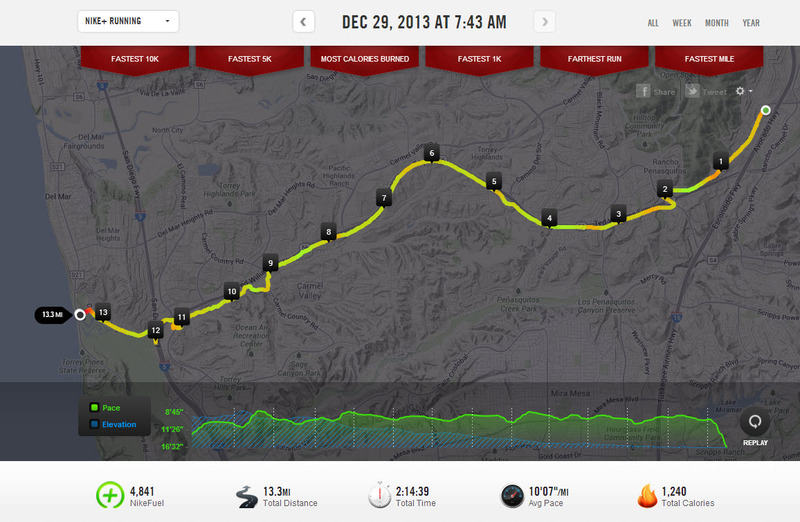 As I’ve mentioned here, I was initially hoping for a 12 min mile pace (about a 2:35 finish time). Then after easily running at around 11:30 each training outing no matter how long, I shifted that to aiming for a 2:25 finish or about 11 min miles. That’s what I had told Renee up until the day before when we were picking up our race packets, and she sort of looked at me sideways and said “Well, maybe we should just see what you can do…” I knew that look, and I knew that meant she was going to try and pull me along faster than I thought I could go. Since I was feeling pretty darn good at the start line despite the lack of sleep, I placed us in the 10 min mile group and said “OK, we will start here and I’m going to just start my Nike+ but then put it away so I don’t hear the mileage updates.” That put us in the front group in the final (3rd) wave of runners that they let go. It’s a good thing they did those waves every 5 minutes because there were a LOT of runners!! Over 2000! Smiling through chattering teeth at the start line. It was in the 40s. 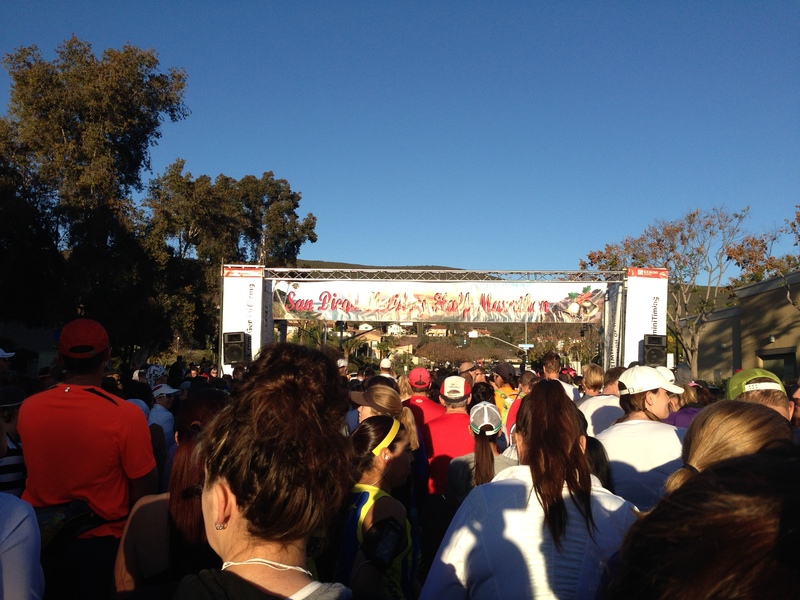 This was a very packed inaugural race – even breaking us up into three groups just barely eased that up. We didn’t carry liquid with us since the race route would be dotted with water and electrolyte stations every mile or 2. We did carry gel and goo calories with us. I opened up my first packet just after the 2 miles mark which took us blissfully into the exposed morning sun which slowly warmed up our frozen toes. I had gloves and sleeves on to start. The gloves came off at mile 3, and the sleeves came off at mile 5. At mile 5 we also passed one of my co-workers who had started with us in the 10 min pace group and then had pulled away from us at first. We thought she would try to run with us, but we lost her fairly quickly. I think when I see her at work on Thursday she will admit to starting off too fast because she needed up finishing 12 minutes behind me. My other co-workers were well ahead and did finish at just at or under the 2 hour mark as they had hoped. Renee was fantastic. This coaching gig is her calling for sure. She pushed me, but also kept checking in with how I felt as she continued to encourage me. She hinted now and then that I would love my finish time if I kept up the pace. Somewhere after we reach the half way point (I remember we both hit the mile 7 marker and said “what? more than half way already? !”) I suspected we were maintaining a 10:30 pace. Then I saw the guy carrying the pace sign for a 2:20 finish (10:30 pace) and I swear we passed him so easily that it was then I began to wonder just how fast we really were going? The other great thing Renee did was to tell me about the route as we would approach either an uphill or a long downhill. She knows it really well since it is a well used bike path, and she rode it tons during her training for her triathlons. That came in so handy so that she could prepare me for elevation changes and advise me on the best tactics to maintain my stride. By mile 9 we were on exceptionally familiar ground for me after all my own training runs. 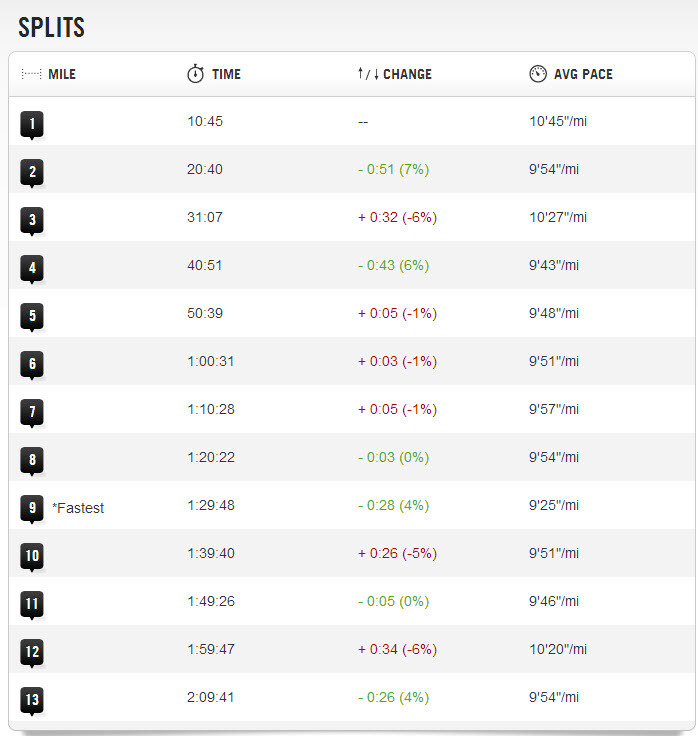 In fact, that mile was fastest one according to my Nike + report. As we approached the trail closest to my house I was *finally* starting to feel some fatigue in my legs. Turning them over at the same pace was a bit harder, and the gentle hills that I knew were there suddenly were not so gentle. I might have cursed out the last couple of them 🙂 Meanwhile Eve, had run down from their house to meet us for the final mile or two so now I had two cheerleaders keeping my spirits up. WHAT? Is that 10? Yup. WHAT?! You see Mile 9? That’s insane to me!! Still smiling at the end – especially after seeing my time! 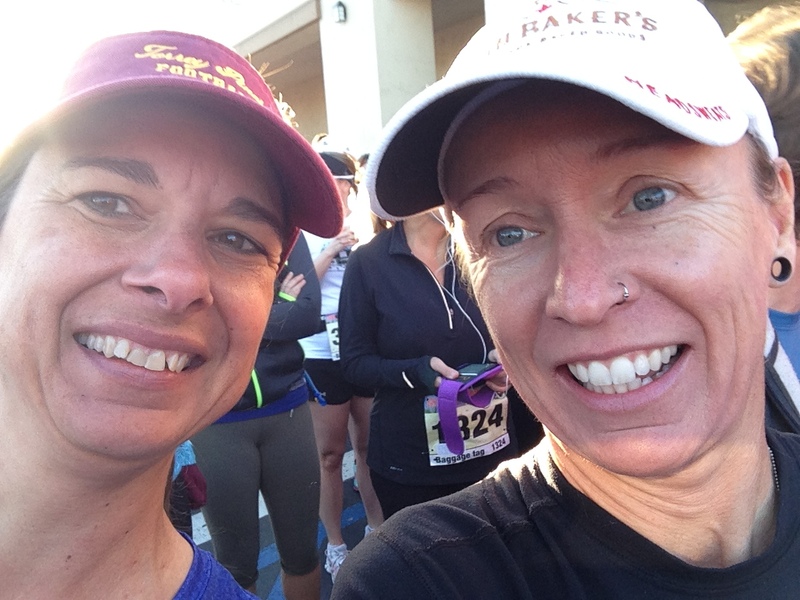 I am absolutely certain that my first half marathon time would not have been so fast without Renee. I also learned that I can push myself more than I think. Especially when I am as completely prepared as I was for this event. The training plan Renee found for me 12 weeks out and the advice and encouragement she, and Eve gave me from Day 1 of my running adventure are why this all ended up being such an amazing race. It’s now two days out, and I can report that other than one blister on my toe on my right foot, I have only been a little bit sore. Some stretching rather than celebrating Sunday probably would have eased that up a bit. OH well – the beer and pizza were EARNED! That is an amazing time! Congrats you must be soo proud. As I get faster that race is definitely on my to do list. 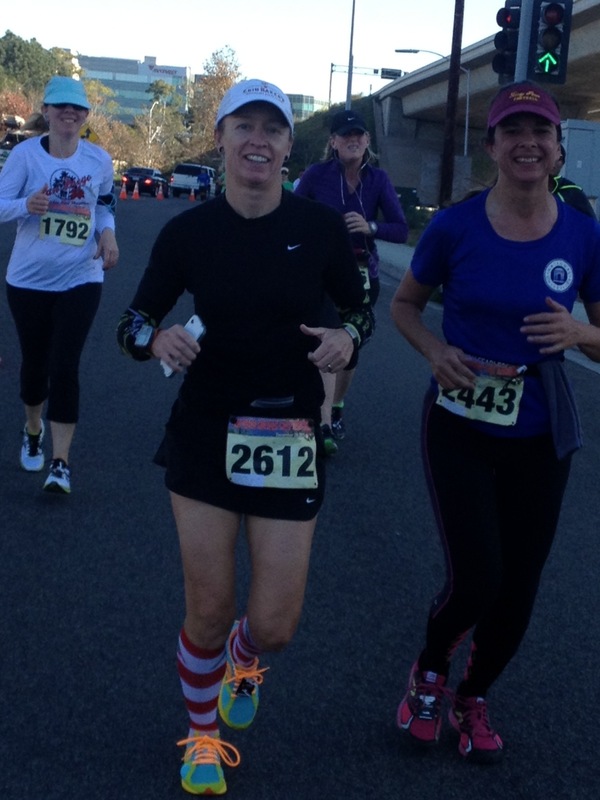 Are you going to keep doing half marathons or do you prefer shorter distances? It will all depend on the timing, but I really love this distance. I figure if I managed to train well for it during the shortest days of the year and while I was still really in the throes of helping out with my son’s football team, then I know I can do this again with the luxury of longer days and less conflicts. 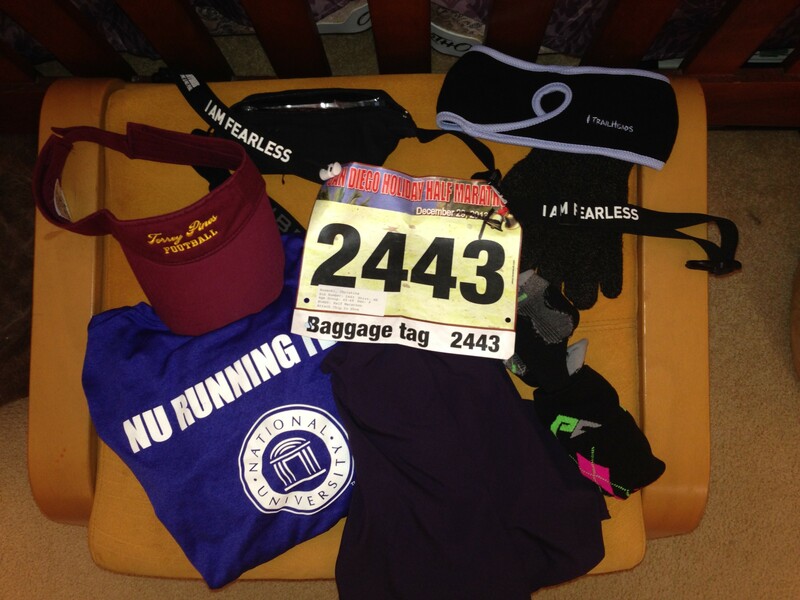 Pingback: Let the running begin (again!) | Trees & Flowers & Birds!